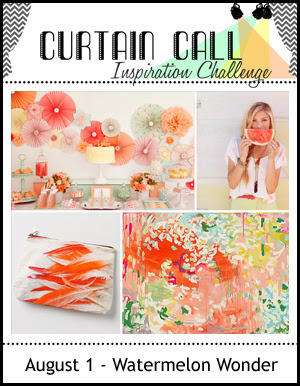 Can you believe that it is already time for the second Curtain Call Inspiration Challenge? Our next challenge is perfect timing August! With Curtain Call you are in the drivers seat and you can take your inspiration however it moves you. This time I took a very literal approach to the challenge and created a card using my Papertrey Ink watermelon stamps and dies! The literal is the watermelon, I created a banner with them inspired by the flower banner in the inspiration photo and pulled the colours from the photo as well. he sentiment is a celebration of the bountiful fruits of summer. We really hope that you come and join us again this week at the Curtain Call. We had an amazing 114 entries last week and they were all such fabulous projects! August is the one month of the year that there is never enough fruit is the house for my family, especially watermelon. What is your favourite fruit of summertime? I am also submitting this card to the Simon Says Anything Goes challenge. love those cute little ants! ok those are the cutest little ants!!! I think those little guys REALLY want that watermelon!! So summery. The banner is different and I'm loving it. The little ant doing a handstand is so cute! 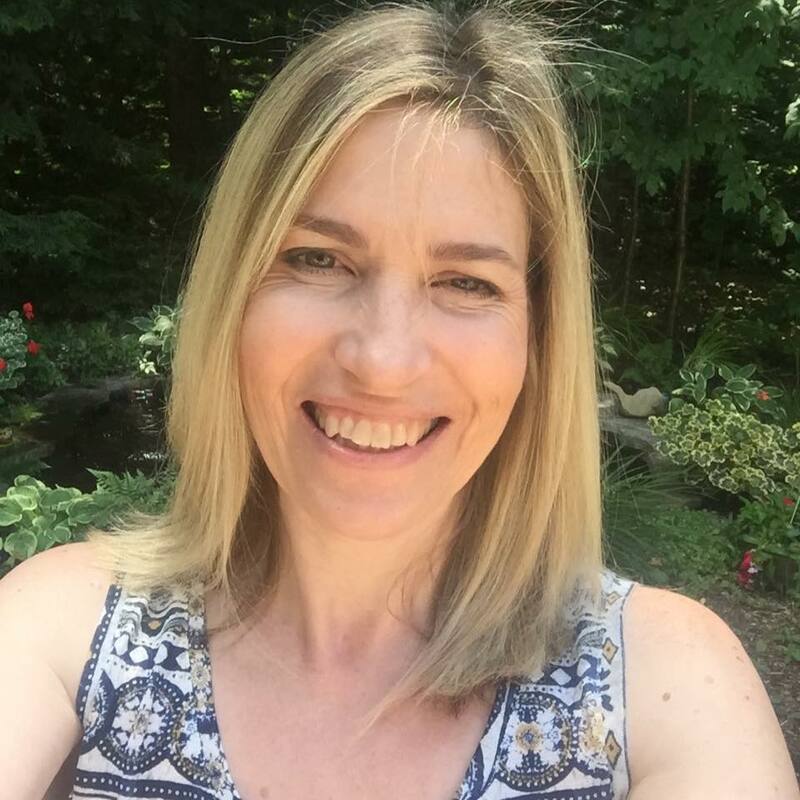 I love your little watermelon banner Tracey...this will be a fun challenge theme! What a SWEET card Tracey. 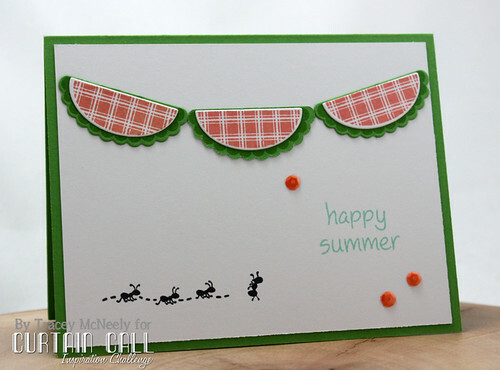 Love those melon slices and the cute ants... perfect card for the watermelon challenge. Oh my goodness! That watermelon banner is so cute and creative! And, love those little ants along the bottom! 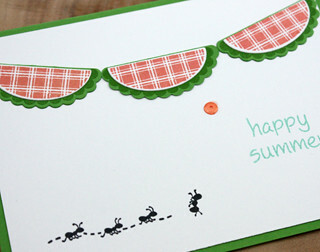 What a darling summer card...love it! a classic summer card, Tracey! love those adorable ants marching their way across the display of melon! Cracks me up....love it all! I can't get over that upside down ant. I'm still chuckling...I love it. This is THE cutest summer card Tracey, love those sweet watermelon slices!! Tracey...just too sweet! I love those ants and I think I can hear what they are saying too, bring more watermelon! Thoses ants are so cute! I love them. Great interpretation of the challenge, Tracey! Love! This is so sweet and such perfect inspiration for this challenge! I love this! This is super cute! I love the little banner! 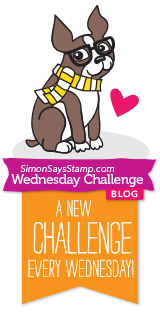 Thanks for playing along in the Simon Says Stamp Wednesday challenge! I worked on my card for the challenge this afternoon. Love these sweet watermelons! And the ants at the bottom are cute, cute, cute!